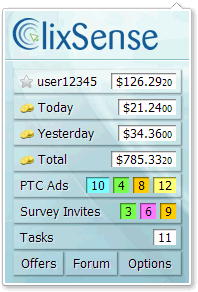 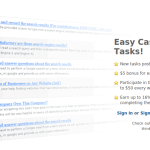 PTC Ads, Survey invites and Tasks come and go all the time, but you don’t have to live checking ClixSense, ClixSense has a handy browser extension to keep track of your account details (such as balance) and get notified when anything new becomes available to you. 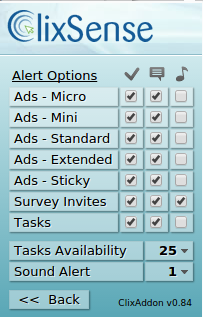 You can get a bonus in the ClixSense daily checklist by having the ClixAddon running for at least an hour a day, but only if the notifications for Surveys are enabled on it. 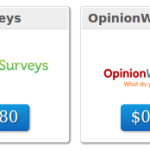 Given that filling out Surveys provide a good income in ClixSense, I believe the normal behavior is to have ClixAddon running all the time precisely to get Survey notifications on it. 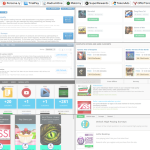 But you can control it by opening the add and and going to Options.